The East End Stingray City Dive is operated by Tortuga Divers located on the East side of the island. It departs from Rum Point (a 25 minute drive from Morritt's Tortuga Resort). One of the largest tourist attractions in the world, Stingray City is in 12 feet of water and mainly, but not exclusively, visited by scuba divers. The site was first noticed about 15 years ago, when North Sound fishermen came to the calmer, shallower waters just over the reef to clean their fish. Soon they noticed stingrays, scavengers by nature, hanging around the boats waiting for any leftovers. 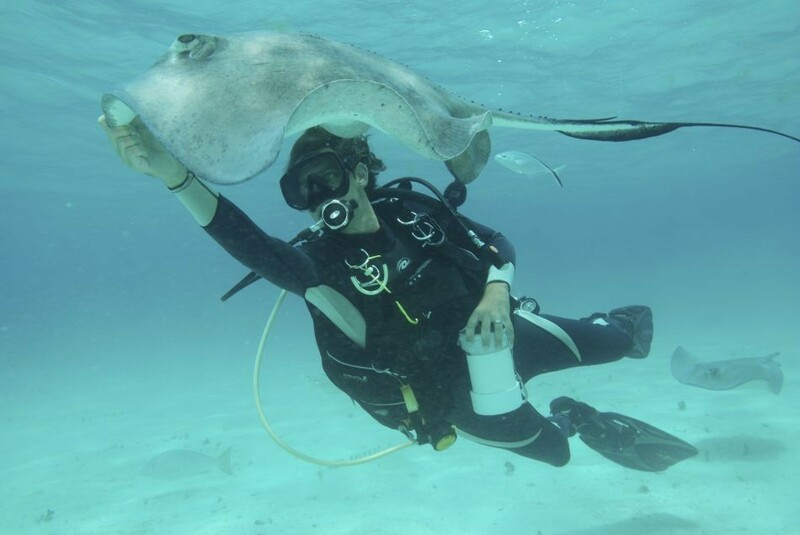 Next, some divemasters got in the water to hand-feed them, and before long the stingrays had become the Cayman Island's most famous and favourite pet attraction. Today, you can swim under, over, and along with the rays. Your dive to Stingray City will take place in a depth of 12 feet. This is a group dive and a must for any traveler visiting Grand Cayman. This dive is a firm-favourite for re-resort divers. Snorkelers are welcome aboard the dive boat and may join friends and family who are certified divers on this excursion. Contact Tortuga Divers to make your arrangements. You must be a Certified Diver or Repeat Resort Diver to book this dive. Certified Divers will required to present your Certification Card to a Tortuga Divers/Red Sail Sports Employee on check-in. *Divers with special needs should note this in the comment section of your reservations.